1. The race to driverless cars: SoftBank (SFTBF) and Toyota (TM) are forming a joint venture that will use driverless-car technology to offer new services, such as mobile convenience stores and delivery vehicles in which food is prepared en route. SoftBank will own just over half of Monet, the new business, while Toyota will hold the rest. It’s the latest in a series of driverless development partnerships announced by tech companies and carmakers. SoftBank’s $100 billion Vision Fund, its tech-focused investment arm, had already committed $2.3 billion to General Motors’ self-driving car unit GM Cruise. On Wednesday, Honda (HMC) and General Motors (GM) said they were teaming up to create a new generation of fully autonomous vehicles. BMW (BMWYY) has joined the board of Apollo, an autonomous driving project from Chinese internet firm Baidu (BIDU). 2. Facebook under investigation: The Irish Data Protection Commission has launched a formal probe into a Facebook (FB) hack that affected as many as 50 million accounts. The commission will investigate whether the company complied with its obligations under new European data protection laws that came into effect in May. Facebook said last week that it closed the loophole, but 90 million users were forcefully logged out of their accounts as a precaution. Irish regulators are investigating because Facebook’s international headquarters is in Dublin. There are still many unanswered questions about the hack: Who carried it out? And what were they trying to access? 3. Bonds sell-off: The yield on 10-year US Treasuries has spiked to the highest level in seven years following the release of positive economic data. US hiring data published Wednesday was stronger than expected, and momentum could continue Thursday if initial claims numbers add to the optimism. A strong US economy and the expectation of rate hikes by the Federal Reserve are fueling the trend. “The underlying message is that the US economy isn’t just in fine fettle, it’s on fire,” said Kit Juckes, strategist at Societe Generale. 4. CNN means business: On Thursday, CNNMoney becomes the all-new CNN Business, covering the companies, personalities, and innovations driving business forward. 5. 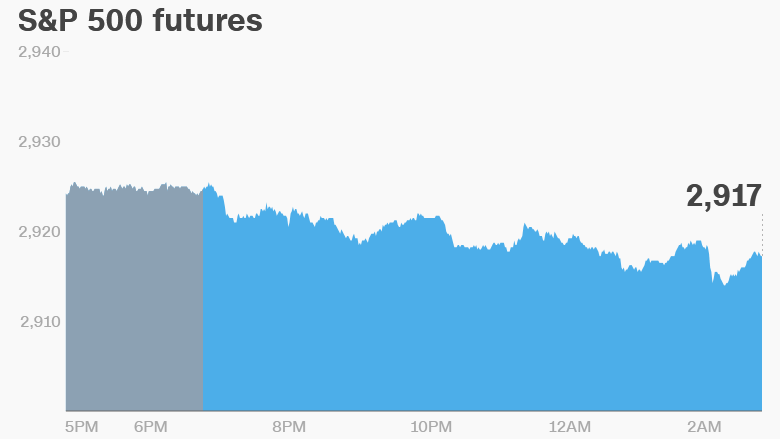 Global market overview: US stock futures were lower. European markets dropped in early trade following a negative trading session in Asia. The Shanghai Composite was closed for a holiday. The Dow Jones industrial average closed 0.2% higher on Wednesday, while the S&P 500 added 0.1% and the Nasdaq gained 0.3%. 6. Earnings and economics: Constellation Brands (STZ) will release earnings before the open. Costco (COST) is set to follow after the close. Shares in Danske Bank (DNKEY) opened 3% lower after the Danish lender said it had received requests for information from the US Department of Justice in connection to its money laundering scandal.